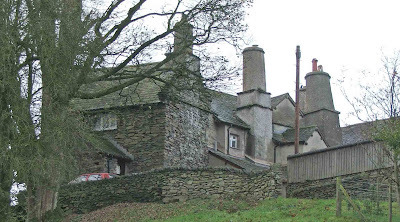 Hollin Hall\How lays just off the B5284 from Kendal to Windermere. The building is a double towered house, consisting of a 14th century pele at one end, and a 16th century\early 17th century central block, and an 18th century tower at the other end. Looking at the photo above, the right hand wing is the 14th century tower. 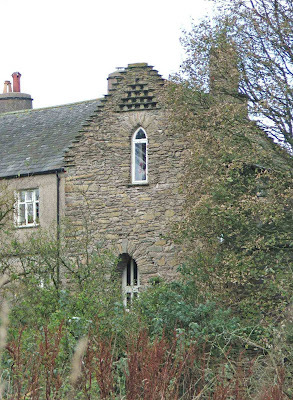 The above photo shows the pele tower from behind, with the hall and other wing on the right, added at a later date with the familiar Westmorland chimneys. The central portion of this building was once held by the Phillipson family, and then later by the Flemings. The tower measures roughly 7 and a half metres by 5 and a half metres....a tiny tower by all accounts. It would have been very lightly fortified, as the walls are only around a metre thick. The tower can be viewed from the roadside, although the views are limited by trees and walls.